“For we are God’s masterpiece. 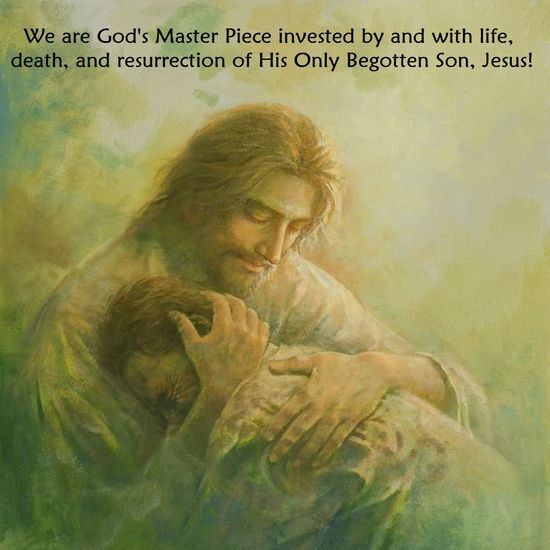 He has created us anew in Christ Jesus, so we can do the good things he planned for us long ago.” (Ephesians 2:10, NLT) We are God’s Master Piece invested by and with life, death, and resurrection of His Only Begotten Son, Jesus! When I think of the implications of what Paul is saying I am driven to my "spiritual knees" with my forehead touching the dirt of the earth. How can I ever live up to God’s Master Piece? The answer of course is I can’t! There’s no way I could ever even come close! But here’s the miracle – it is the Holy Spirit given to us freely by God BECOMES a bridge from where we are in our life to where God not only wants us to be but also who he wants us to be. The truth that keeps us alive and well is we are God’s Master Piece not only because he says we are but also because Jesus lives in our hearts and at the same time the Holy Spirit “cements” us there. There is no greater blessing from God than that of being His Master Piece and there is no greater way for us to bless God give our lives to him.